Welcome to March 2017 friends! The year is going by so fast and I look forward to warmer days. The 'shirtdress' on this post is an oversized shirt (as described on their website) and I fell in love with the volume, layered fill hem and exaggerated sleeves. When I received it, I instinctively thought about pairing with a set of OTK boots. I have had these Over-the-knee boots for about two years and they are very comfortable and easy to slip on. 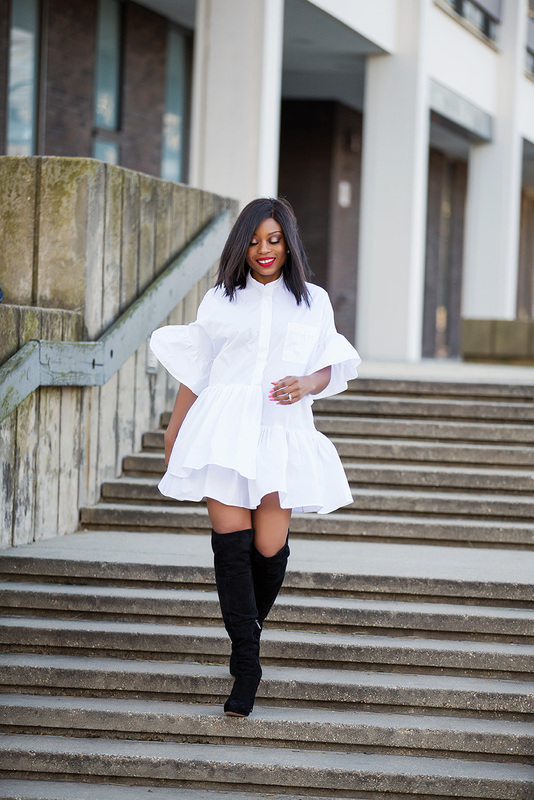 OTK boots are great ways to style shirtdresses or short dresses during this season. The dress speaks for itself so I kept the styling and accessories at a minimum. Love how you can style this dress in so many ways! Fabulously adorable dress. So cute and chic. Hooray for warmer days! Absolutely love this look!